I have another really busy week coming up. Thankfully, this my last one before Christmas vacation time. Score! Due to the busyness (rehearsal or gig of meeting every evening this week. yikes), I spent a portion of my Sunday planning so that I won’t starve by Thursday and resort to inhaling whatever I lay my hands on first. Because that often means that dinner is a slice of bread and a handful of chocolate chips. Tasty? Sure. Nourishing? Not as much. It’s all about having a plan, people. Whole Wheat Bread: baked. In the pantry. Breakfast toast, lunch sandwich. Rice: I have a container of rice in the fridge waiting for whatever I feel the need to do with it. The options are endless with this one: stirfry, red beans and rice, stuffed peppers, etc. Pasta: add marinara sauce, microwave, and go. Spaghetti squash: yum yum yum. I have another one all cooked and chilling (quiet literally) in the fridge for an easy, healthy veggie dinner. Ready, set, go! Bring on this week. Before we know it, it’ll be Friday again, right? Nice planning… extremely versatile options there! This is my biggest weakness – I don’t plan well for food. And with a limited kitchen and limited unpacked cooking things its even more difficult. But we will eat this week. I’m determined. 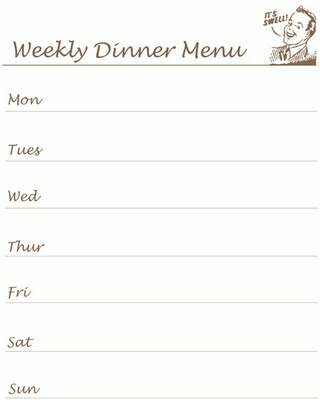 We plan out meals for every week. It helps keep us in budget and eating better meals. True statement. I didn’t think about the budget considerations, but you’re right! It definitely helps me keep a lid on my grocery spending.